Slidejoy App Review: Is Slidejoy-App Scam or Legit? Smart phone in reality, is an important part of our daily life. It is so connected to us that it is been carried by us everywhere. Basically, it is a replacement of computers and laptops. These days, people are able to earn money by using their smart phones, that to just by unlocking it. 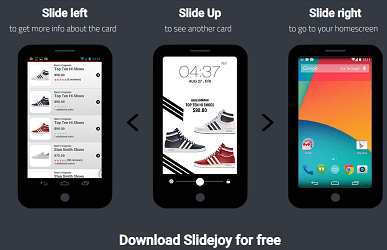 An app named Slidejoy helps to earn money by unlocking our smart phones. Slidejoy is a lock screen app which allows you earn rewards both for installing it and letting the ads run in the background every time you unlock your phone’s screen. The rewards are earned in app currency called Carats which can also be redeemed in cash. The app is suitable for businessmen and advertiser who can engage people about their products. Their promos and ads will be visible as soon as people unlock his/her phones. Then he can choose to view its full information or wish to precede their home screen. You don’t need to do anything specific, but just install the app and let the ads run. You just need to decide whether to swipe right to proceed to your home screen or swipe left to view the full content about the ads. In order to earn money, first thing you need to do is to download the app and sign up using your Facebook or via email. Registration is simple and free. You will even get 20 Carats as signing bonus. After completing the registration, your phone will get a new fantastic unlock screen. You will need to swipe right to go back to your device or left to view the detailed ad. Then, you just need to start unlocking your phone in order to earn Carats. The moment you unlock your phone you will be viewed an ad or a story and you can choose to learn more about it or directly go to your device, by swiping left or right. The company pays you in Carats, regardless if you choose to swipe left or right. It’s not compulsory to choose left to view the full content, either way just but unlocking your phone to go directly to your home screen you can still earn. Thus, the app keeps the record of the ads you swipe left in order to learn more about it, so that it can show you similar ads like that. The research shows that a person can earn up to 200 Carats per day just unlocking the phone and letting the ads run. Hence when 1000 Carats is equal to $1 then 200 Carats is equal to $0.20. Now this means that a person can earn nearly 6000 Carats a month which equals to $6 and even you can earn up to $15. As this doesn’t sound cool but as you are not doing anything other than unlocking your phone, this is a better way out. Slidejoy app also provides other ways of earning by using your device. There are surveys which can provide you an extra income. You need to first qualify in order to answer the survey. The app also offers an Offer tab, which can provide you different ways to earn. In the Offers tab, there is a Scratch game, where you have a chance to earn more Carats. There is also an Offer where you need to install an app, and you will be paid in Carats. You will earn nearly 100-500 Carats, but the amount of Carats you earn depends on the offer availing at that particular time. Fortunately, the app also provides an opportunity to earn more by Referral program. Your referred friend will earn 100 Carats for registering via your Referral link. Hence, you will also get 100 Carats for every 500 Carats earned by your referred friend. Therefore, the Carats you earned can be redeemed in cash or you can wish to donate it. In order to redeem the cash, you need to have at least 2000 Carats balance in your account i.e. $2 and you need to keep the app installed in your device for a month. Payments are preceded on every 15th of the month and new users will have to wait possibly 3 months before they receive their first payment. You can be paid by PayPal, Amazon gift card, Visa Prepaid Card, Walmart Gift Card or you can choose to donate your earnings to a charity. What I liked about Slidejoy app? It’s easy to use and simple to operate. By using this app you don’t have to do something special but just unlock your phone as normally you do and the company will pay you for it. The spectacular thing about this app is that it pays you in the same amount either you choose to skip the ad or browse it to learn more about it. The minimum requirement for cash out is also not very high, minimum 2000 Carats i.e. $2 is needed to withdraw. The app provides various options to redeem but most suited is cash. What I disliked about Slidejoy app? The app is only available for US people and only for Android users. Thus, this limits the number of friends that can be referred. The worst thing about this app is that you have to wait 3 months to receive your first payment. All in all to use Slidejoy more effectively you need to continuously use this app. The app is not an opportunity that will make you rich or you will be able to pay off your rent. Slidejoy has a limited earning potential. You can expect to earn $5 a month if you just unlock your device to view the home screen. The app is safe to use or bogus? In a reality world it seems next to impossible to earn money just by unlocking your device. And thus it creates a doubt in everyone’s mind to consider it as a scam. But this app is a legitimate site which in actual pays you. Therefore, this is a great app to earn for those things which you would do anyway. By keeping in mind all the positive feedbacks and judging points, we definitely recommend this app. Hence, Slidejoy is completely legit and it’s a real deal and an effortless source of income.